Welcome to the dark side. But don’t worry, there’s cake! Black brushstroke cake, to be exact. 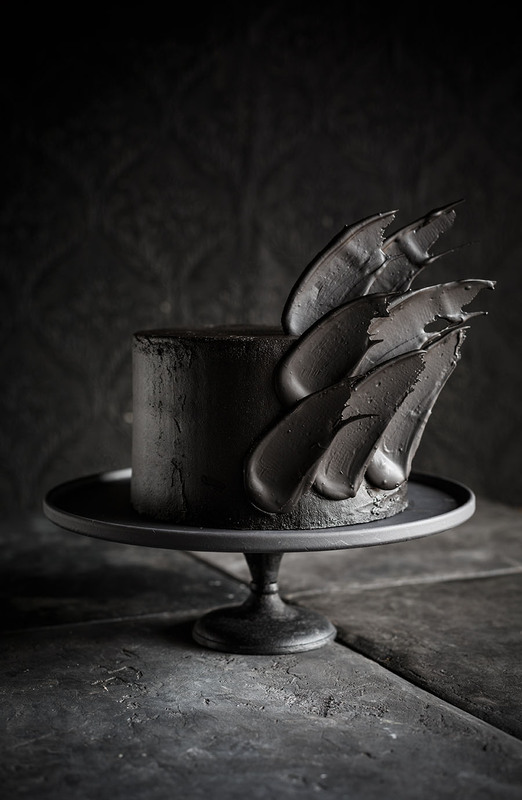 Earlier this year, in my monthly baking column for Food24, I wrote about how darkness was going to descend on baking and treats were going to go gothic. 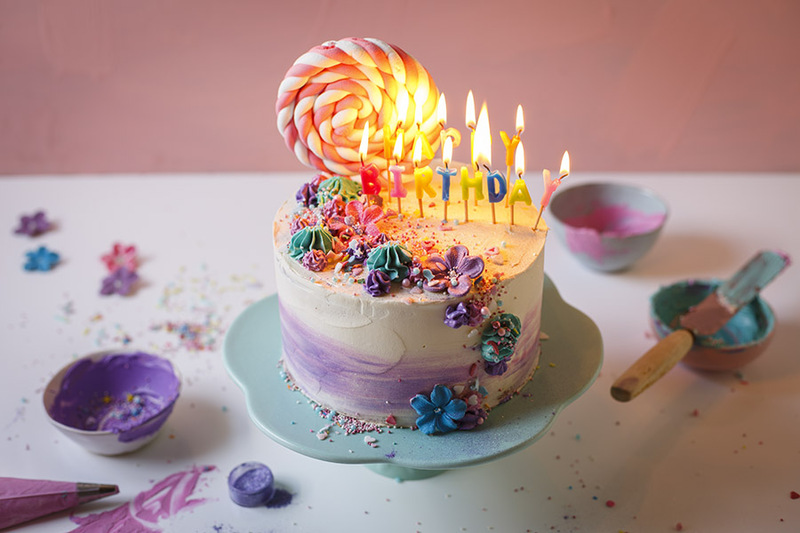 Sometimes trends are silly and sometimes they can be fun – especially when they tie in with a celebration. And while I definitely don’t celebrate Halloween, it does give us bakers a fantastic excuse to get super creative. When the folks over at Food & Home Entertaining Magazine asked me to create a gothic food feature for their October issue, it was like putting me in a candy store! This Black Brushstroke Cake was the result and it is one heck of a showstopper – a jet-black velvet cake is sandwiched together with burnt vanilla buttercream and decorated with black chocolate brushstrokes. What is burnt vanilla, I hear you ask? 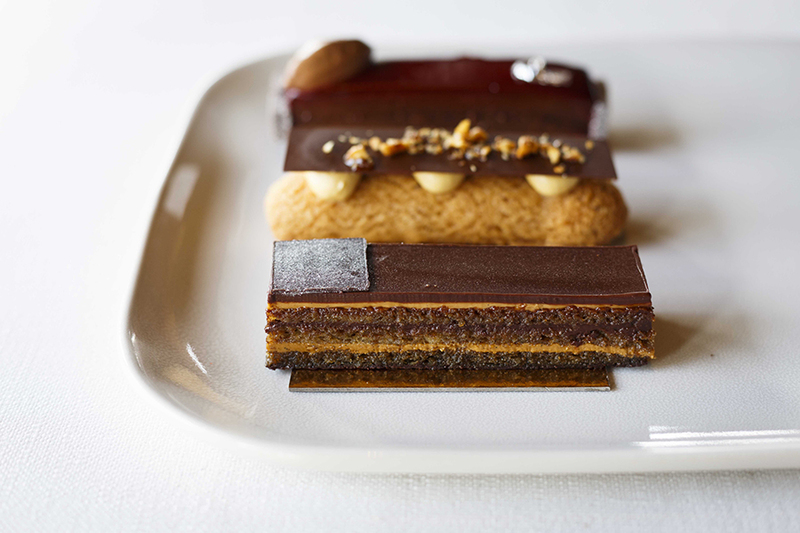 Well, by baking the vanilla, the sugars in the bean caramelise giving it a more intense, toasty flavour. 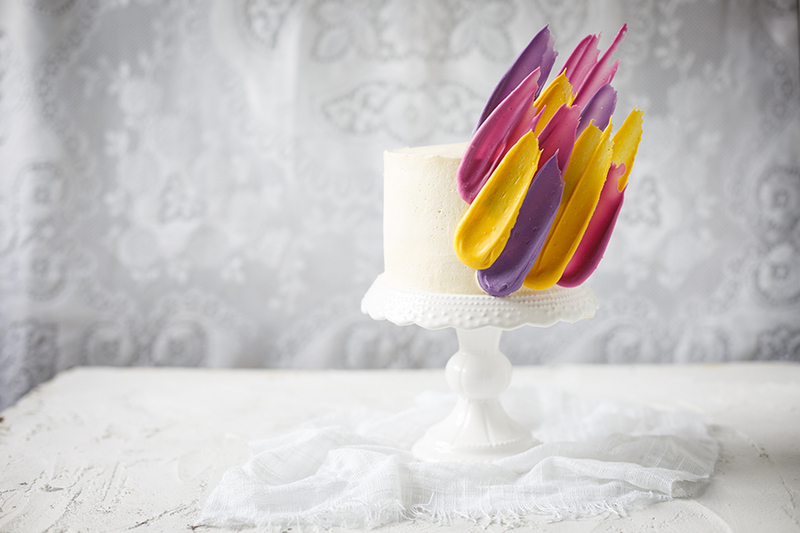 If you haven’t yet tried the chocolate brushstrokes – check out my tutorial here – it’s a lot easier than it looks! For the cake, preheat the oven to 180˚C. Grease and line 3 cake tins (20cm diameter) with baking paper. In a large bowl, sift together the dry ingredients and make a well in the centre. In a separate bowl, whisk together the eggs, coffee, buttermilk, canola oil and a few drops black gel food colouring. Pour the wet ingredients into the dry ingredients and whisk until just combined. Divide the batter among the tins and bake in the preheated oven, 30 – 40 minutes or until springy to the touch and a skewer inserted in the centres of the cakes comes out clean. Allow to cool in the tins, 5 minutes, before turning out onto a wire cooling rack to cool down completely. To make the icing, place the vanilla pod on a baking sheet in the oven and roast, 5 minutes, until fragrant. Scrape the seeds from the pod and discard the pod. Place the seeds in a blender or pestle and mortar and blitz or pound to form a fine powder. Cream the butter until light and fluffy, then add the vanilla powder, 60g cocoa, the icing sugar, milk and enough gel food colouring to make a black icing. Beat until smooth and completely combined. For the brushstrokes, line a baking sheet with baking paper. Mix the powder colouring into the melted baking chocolate. Drop a teaspoonful coloured chocolate onto the baking sheet, then use the back of a spoon to smear the chocolate like a brushstroke over the baking sheet. Repeat until all of the chocolate has been used up. Allow to set before peeling off the brushstrokes. 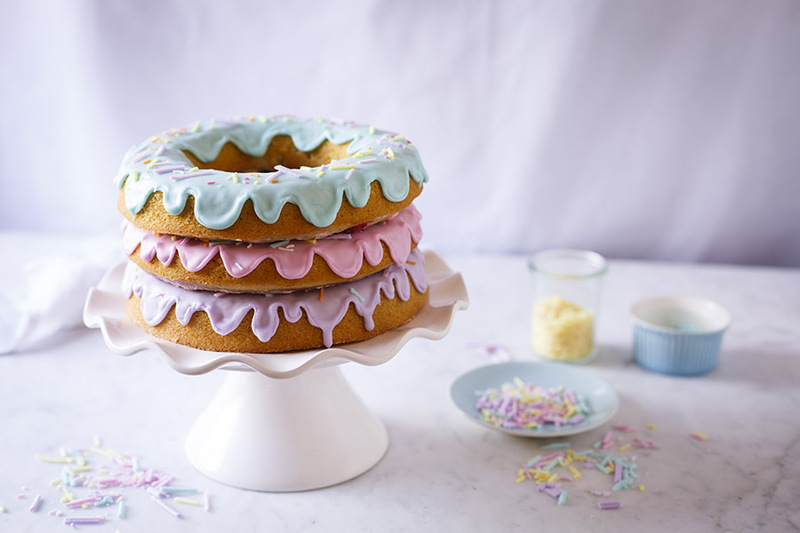 Assemble the cake by layering the sponges with burnt vanilla buttercream icing between each layer. Cover the entire cake in icing and smooth out with a palette knife. Using dollops icing, stick the brushstrokes on the front of the cake to decorate. 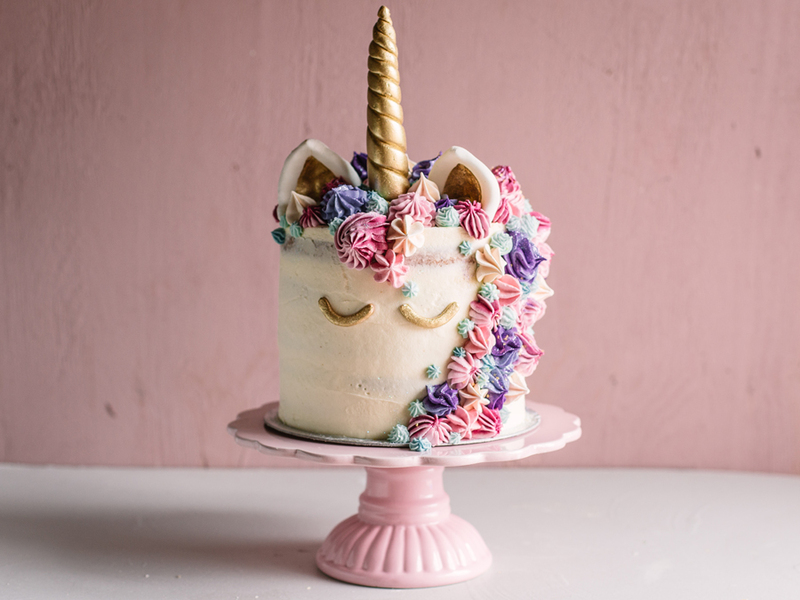 Dear Kate, I spotted this cake in my Food & Home Magazine along with a range of other “dark” recipes like “Onion-ash Goat’s Cheese with Poppyseed crackers”….PLEASE PLEASE could you add those to your recipe index. I’ve searched everywhere online/Pinterest and can’t find them? ?